Today’s ride: The Ride to See is a charity event that benefits vision research and programs for the blind. The rides start from Galena Maryland on the Eastern Shore, and goes through towns like Rock Hall and Chestertown. The ride is held on the second saturday in August. This can be a hot ride, so hydration is important. The Ride to See rolls through farmland, past the Chesapeake bay, by creeks and rivers, and it also coincides with a festival in Rock Hall. Rides range from 15 miles to a full century. The shorter rides can be good training rides for longer rides later in the year. The Experience: This year it was a smaller crew riding the Ride to See, just Ron, Rita and Myself. I set out feeling good, so I led most of the way to the first rest stop. The day was still cool, and while this wasn’t the best way to go, it felt like a great day to ride. The second leg to Rock Hall was relatively fast. 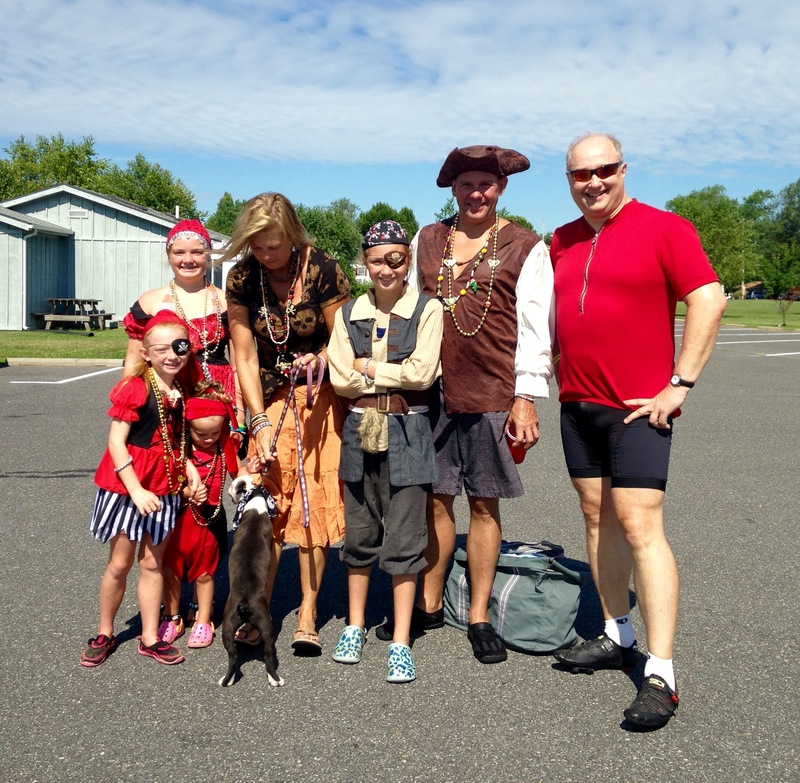 When we reached the rest stop, the “Pirates and Wenches” festival was lively, and we rolled past the beach and into the rest stop with pirates all around us. I was starting to feel the heat, and made the most of the stop, but by the time I got to Chestertown, I was beginning to feel the heat, and all the pulling I did early in the ride was beginning to tell. I began to suffer in the hills between Chestertown and the final rest stop. A quick stop for a gel helped, and I managed to hold onto the team as we reached the final stop. After a good rest and more water, I found a way to finish the ride strong. 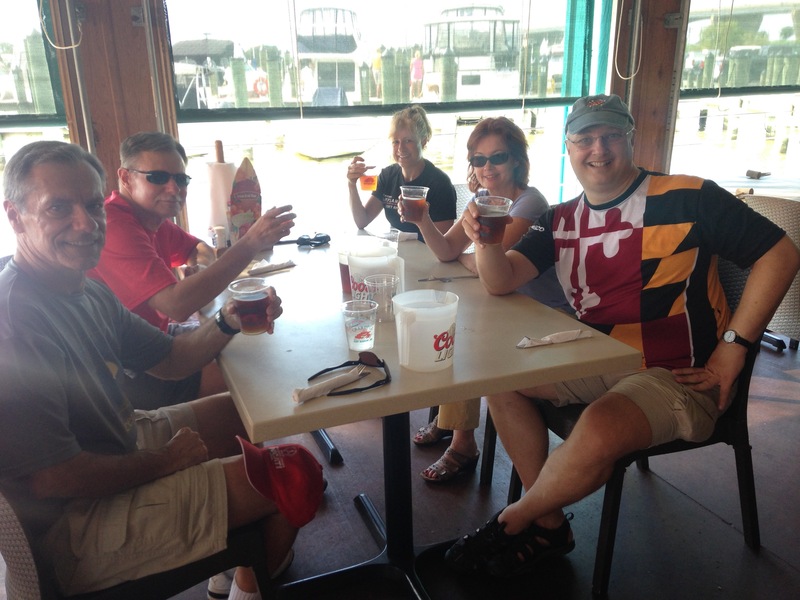 We managed to find more friends to celebrate with at the crab deck afterward – and the celebration made the difficulty of the ride worthwhile. Selections from my mental iPod during the ride: “Houses of the Holy” by Led Zeppelin, and “Lost in the Supermarket” by the Clash. Stats: 100 Miles ridden, and despite pushing too hard in the first half of the ride, I managed to finish the ride without incident. Tom Roman, Ron, Theresa, Rita and I celebrate a memorable day. 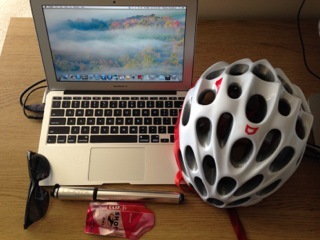 This entry was posted in Cycling on September 17, 2015 by kitefencer.